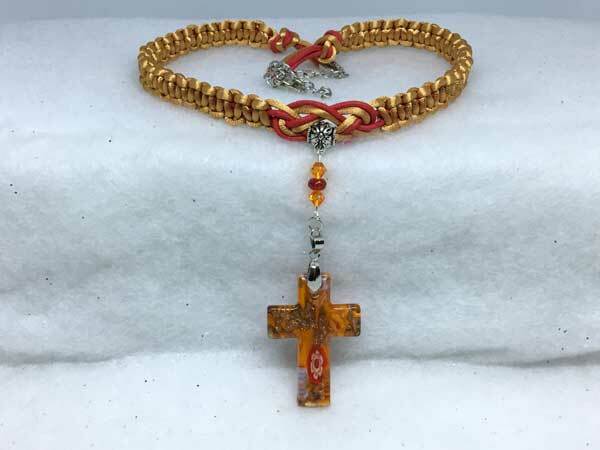 This corded necklace is made using waxed cording along with satinique cording. The length can vary from about 17 to 20 inches with a center jeweled piece that adds 4 inches. It is done in gold and red. The focal bead is a beautiful lampwork glass cross with an orange background and bits of color in rose gold, white, and red. It is hanging separately from two small orange crystal bicones and a fully-faceted red rondelle. It is SO lovely in person and will get lots of compliments!